I’m sorry for not having a comic today everyone. I’m not feeling well and I can’t focus on it. Gonna take a day off and resume things on Wednesday. Garfield was right, Mondays are terrible. That’s ok, take care Dave. Hope you’ll feel better soon ! Get better, Dave! We’ll manage without an update somehow. 😉 Take care of yourself and we’ll be here when you get back. That would actually be an awesome tradition to start here. Go for it! I had her Vomit Fish as my wallpaper for, I think, 2 or 3 years, a long time ago. It’s still there under the ‘ancillary art’ tab up at the top. And now it’s my wallpaper again! Take care of yourself and get plenty of rest. I guess I’ve watched WAY too much TV lately, first thing I thought of was; “Dads don’t take sick days! Dads take NyQuil.” Which just goes to show you how sick TV programming is. Wishing you speedy recovery, and good feels. Take it easy. I hope you feel better soon. Take care of you, Dave, and thanks for years of enjoyment with Selkie, Sue, and Kathryn. No worries, Dave. Your well-being comes before the comic. Here’s hoping you feel better soon! No! How dare you skip a day on this comic you provide for us for free! Dance for our amusement, monkey-boy! No worries! You take care of yourself. We’ll be here ready and waiting when you feel better! 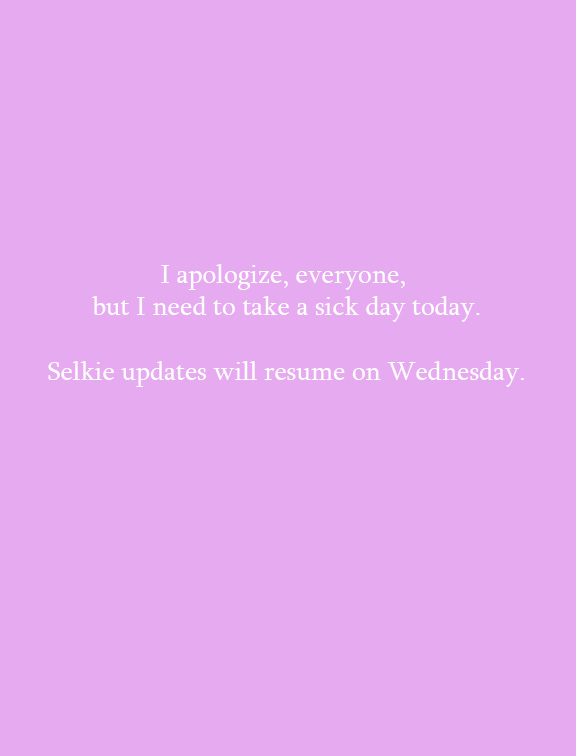 Everyone I know is sick right now! Take care of yourself. As for me, entering week 2 of headcold, so… yeah. Thank you for letting us know – now get to bed, get some rest, and don’t worry about your rabid adoring fans. We can wait for a few days (or really, however long it takes). Feel better soon! You do what’cha gotta do, Dave, and we’ll be here when you get back. Hope you feel better soon! Dayquil for the win! Nyquil for when you need some bleeping sleep! Feel better soon Dave!